Stitching a printed layer adds texture, and visual interest, plus takes away the "carbon copy" feel of printed images. 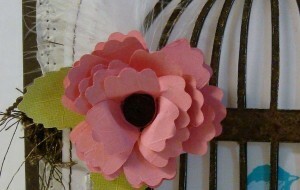 Adding elements such as this fringie-ish trim, and quilled flower add luxury to the project. 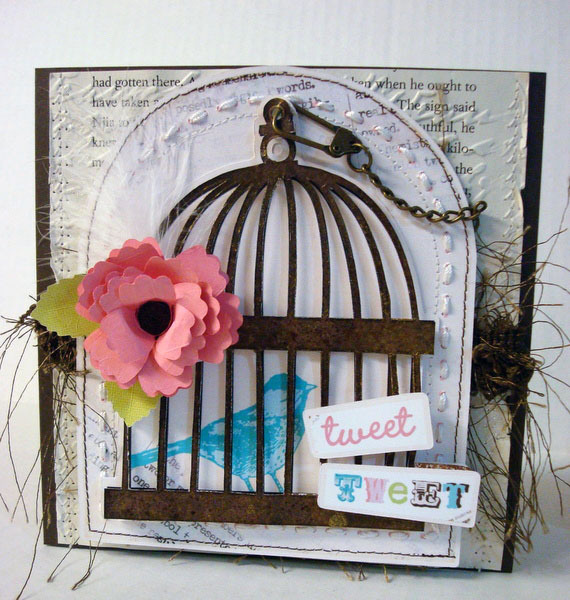 A chain, and foam tape to pop the bird cage away from the bird give the image a more "realistic" spin. Stamped, printed, die cut, it doesn't matter...if you add embellishments to them they become your personal artwork, and not just another cookie cutter image. 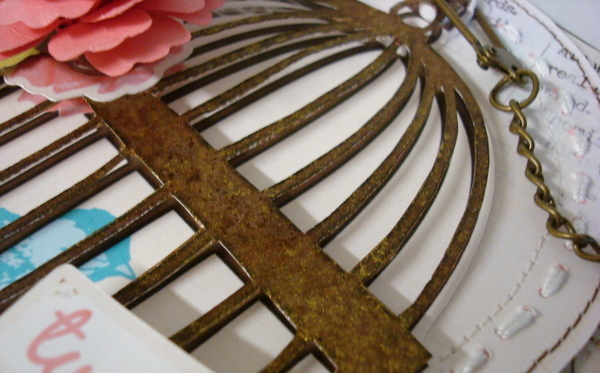 Check out the metal effect I achieved by inking the cage in a metallic ink and embossing powder! I know its another one of my "more is more" cards, but when you are having fun, more IS more!!! Don't jump ship on me just yet my friends, I promise I will be back to a regular schedule after Labor day....in fact lets do this right! I will be announcing a holiday giveaway on Friday AM !!! I'm usually a LIM girl, but I do agree sometimes More is More...and you rocked the MIM...I gotta get out my Imagine again (it got moved AGAIN...that means re-calibrating *sigh*). Your card is such an inspiration. So pretty! Where did you get the chain? I too need to use my Imagine more often...It always gets put on a back burner! "How tweet it is!" as an old tv guy might have said! Love the details. Thanks for the inspiration. Wow-- I love the effect of the metallic ink and embossing powder. Great tip! Why would anyone jump ship on you, lady!?! You're fantastic and that bird cage is unreal. amazing. Gorgeous! I love the metal look of the birdcage, very cool. Giveaway, and Vintage style tags!